Q: There are lot of rumours regarding "Jaggubhai". People are debating - Will it start? Will it be postponed? - What's exactly happening? A: We were supposed to start in July. But, till Aug 15 (2004) people say that it is a "Soonya Madham". (inauspicious). After Aug 15 we will start it immediately. Q: In the still published during its announcement your get-up resembles Osama-Bin-Laden. A rifle by your side, "kumkum" tilak on your forehead, "Rudraksham" in your neck. What do they convey? A: To many people Jaggubhai appears to be an urgent announcement. But, that's not true. That is a story which has been in my mind since 20 years. I have heard many stories for my next film, but none of them could satisfy me. I then narrated the story in my mind to Ravikumar. He said "Its good. We can do this." The picture you are referring is very significant to the movie. When you see the movie you will understand that. Q: Who is the heroine? A: We are talking to Aishwarya Rai. The heroine role in this film is not as in other movies. In this story, the heroine's role is very important. This role has similar importance as Neelambari's role in Padayappa. Actually, Padayappa's Neelambari should have been portrayed by Aishwarya Rai herself, but was not possible. One of her English films got postponed ... probably she will do it. Q: Many commented that the Neelambari role was characterised based CM Jayalalitha. Is there something similar kind of politics ... ? Q: Jaggubhai's ad-phrase - �God, save me from my friends, my enemies I can deal with myself!� What does this mean? A: (laughs) Even that's from the story itself ... at one stage the hero feels that his friends have done this to him. Not just in politics, in cinema, even friends from general life hurt us sometimes isn't it? They way they behave ... doesn't these affect you? That's what this statement conveys. Friends are more important than mother, father and guru. If they are not good, nothing else will be good. Aren't bad habits cultivated from friends? Selecting your friends is more important than selecting your spouse. Q: Kalaignar, people who are with him - can we categorise them as "friends" ? A: Ha .. ha .. ha .. (a small silence after the laugh). Kalaignar is a man of very high stature. Everyone knows that he is a friend ... I am not keen on telling other names. Q: Did you talk to Kalaignar after the elections? A: No. I have congratulated all those who got ministries. Isn't it a civilised custom to congratulate the winners? But, that does not mean we should talk ill of those who lost. Can we go to those questions without politics? 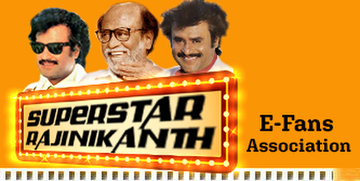 Q: Before you acquired the Superstar image we could see a different Rajini in various films. But, later we could see only Superstar formula films. After Baba, now in recent times, people like Bala, Dharani, Selvaraghavan, Gautham are creating a new trend. Will your forthcoming film take all these into consideration? A: When there is certain expectations from me, I can't change them. For technical excellence we are definitely using good technicians. We always maintain a good standard. But, people expect hero and heroism from me. Isn't it? So, I can't come out of that track. This is the reason for me not doing many films. Now, I don't have to do anything for money or fame. By God's grace I have got them everything in plenty. I am not sure if people will like if I do a different kind of film ... the investment is also high ... and so I am slightly keeping myself away. (laughs). Q: Producers, distributors, theatre owners - all of them agree wholeheartedly on one thing. "Next to MGR, only Rajini films are pouring profits". MGR had a political vision. In your films too many scenes, dialogues, punch dialogues have created a kind of expectation about you in the minds of people. But, why is it that you have not entered politics directly? Q: Then, in future if the circumstances are created, can we consider that you might enter politics? A: I don't know! Can you predict what will happen in next 2 years? (Points to the Pooja room) Whatever anyone thinks, its more important for the God to think. I am a strong believer of destiny. I just proceed in my life accepting whatever comes in my way. Q: You are the one who popularised "linking of rivers". What is its state now? A: Its regrettable that the politicians do not have a foresight in this project. Only statesmen will have a long-vision, not politicians. KS Rao has spoken on this project many years ago. If this was started then itself, will it not have been complete by now? Leave it. Even if we start now, hey, let it take even 40 years to complete, will not our future generation benefit from this? Money is not a problem at all ... then shouldn't this be started? What will happen by only me speaking on this project? Henceforth I will not speak on this project ... only if everyone seriously think on this project there will be progress. Even Kalaignar has spoken on this ... I was even surprised by this. The night, previous to the day I spoke on this project in a press meet, he too has spoken on this project. Everyone should speak ... act. The car ('thaer' in Tamil) moves only if all the people pull, isn't it? If this fructifies, how many people will have employment, how many industries will prosper? How many people will benefit! ... How important this work is! Q: People say that many places will be submerged if the rivers are linked ... ? A: For 100 people to benefit difficulties will befall on 10 people. Do you know the significance of "Bhoomi Pooja" (ground breaking ritual)? Many insects, worms and other living beings are living in the place where we are to construct a house and lead our life. "Bhoomi Pooja" is a ritual of asking their forgiveness. Vajpayee is very interested in this project. He has spoken open-heartedly on this with me. Q: "My vote is for BJP" - what is the reason behind this public announcement? A: I have already spoken on this clearly. Though many politicians and political parties have spoken about linking the rivers, I think that only BJP is serious about implementing it. Since I have contacts with them on this, I felt it possible to contact them personally and stress upon this project. That's all. Else, if I wish to enter politics I will enter directly and not pointing towards others. Q: Your take on clash with Dr. Ramadoss? A: This election was swept by a massive wave. Not just a man, but even a banyan tree would have been washed away with it. With regards to Dr. Ramadoss we just showed our protest. A protest in a democratic way. I am not 'man' if I don't speak even after seeing the way they attacked my fans in Madurai. The people who are asking now "why I spoke?" will also have asked "Why I did not speak?" had I not spoken. Q: Everyone knows PMK's opposition to Baba. Now that they have won in all the 6 constituencies, if their opposition to your Jaggubhai is more furious? Q: Do you think that the clash between you and Ramadoss will continue? A: Kalaignar has helped a lot in this issue. The clash between me and Ramadoss could have gone in a different way. During and after the elections if it has been peaceful on both the sides, the reason behind that is Kalaignar. Both - me and Dr. Ramadoss - should thank him for that. Q: What is your take on this election result? A: People in our country (Rajini might have meant only TN. But I have interpreted for the entire country) always cast their vote in either anger or emotionally or in sympathy. We cannot infer that decision to be right always. But, one thing is pretty clear - people are watching everything silently. They are saying that they will vent their anger at the right time. Q: Did you get an invite for Stalin's daughter's wedding? A: I received the invite. But, not in a formal way. Politics is different from such private function. I could have been invited in a better way. Q: DMK, ADMK - people are definitely fed-up with the option of only these two. The third place is vacant from long. Will you fill this in future?